This is one of those games where I find myself not to be the slightest bit interested in it, yet I know I will end up buying it, on launch day, and will enjoy the hell out of it. Just for some reason the premise just doesn’t hook me in. I feel sorry for all the xbox360 players who won’t be getting the full effect. Why wouldn’t the 360 get the full effect? I must not know as much about the game. This game looks awesome! 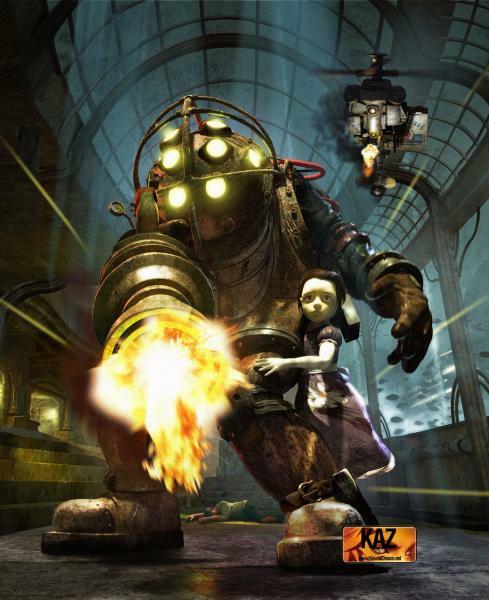 Anyone know what the relationship is between the Big Daddy and Little Sister and what their role is in the game’s storyline? And Neuromancer – why wont the XBOX have the full effect? What will it be missing? I’m sure the 360 version will have everything the PC version has. I haven’t heard any different. And the 360 version will have WAY MORE than the PS3 version, which doesn’t exist. Wait, does the PS3 have more than 5 original games yet? Scratch that Bioshock is using Unreal Engine 3. I was thinking of Crysis. Upon further inspection… I was right. Suddenly, on second glance at the picture, I’m reminded of Fallout 2. Neuromancer, I still don’t see what you’re saying the PC version will have over the 360. I agree with you on Crysis. so does anybody know the storyline and how the Big Daddy and Little sister fit into the scheme of things? Any links? You’ll have to understand they are shipping two types of disks. For PC the disk will have both Dx10 and DX9 versions. The 360 does not support DX10 so it will be getting the toned down version. The water will look cooler on a PC. Thanks Jet, I understand their play in the game and that the big guy protects the little sister, but what I’d like to know is… Why does the big daddy protect her, why is she wondering around as she does, what are their roles in the storyline? The Bioshock makers mentioned that it’s pretty interesting discovering how they fit into the story, and that’s all cool, but I want to know now dammit. I love this pic and would love give to my tattoo artist. Any change of getting a non-watermarked copy? I’ll posth tat when it is complete!